ok, so we were a little delayed this morning because it was a late night, but we’re here now and didn’t get the worst seats in the world. and we were still in time for the first presentations of the day which include videosurf, gazopa (presenting as i type), fotonauts and bojam. this mornings judges include robert scoble, sheryl sandberg, joi ito and bradley horowitz – not sure if they’ll be as feisty and fun as some of our previous judges but so far they’re giving the startups some great advice. for more pics and comments throughout the day check out my tumblr page. 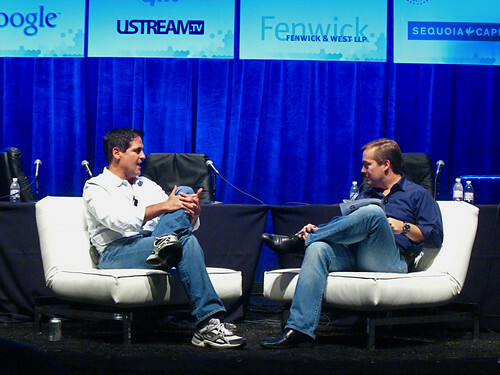 for now, enjoy this pic i took of jason calacanis interviewing mark cuban. excellent interview – read the entire transcript on TechCrunch. 10 Sep	This entry was published on September 10, 2008 at 5:15 pm. It’s filed under tech and tagged conference, startups, TC50, tech, Techcrunch50. Bookmark the permalink. Follow any comments here with the RSS feed for this post.